« Tide Free & Gentle Laundry Detergent 50 oz Only $4.48! We recently got a new table for our living room, and when I was looking for something to add to its decor, I came up with this simple, DIY project. 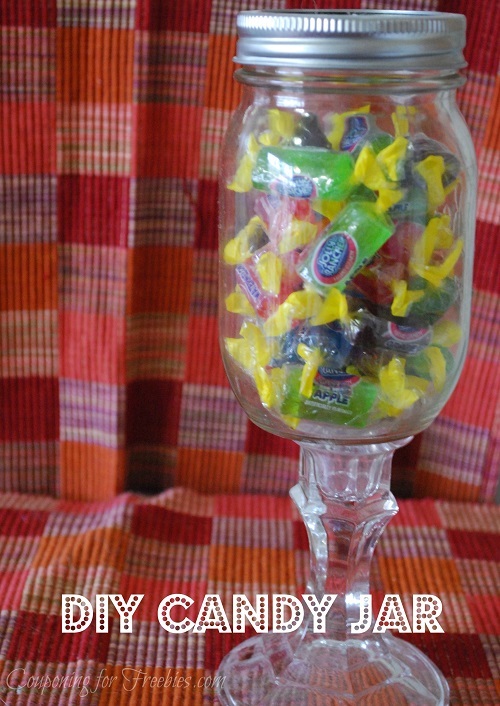 A DIY candy jar! I love how easy and CHEAP this is – it uses 2 items (if you already have epoxy at home; if not, it’s only 3 items), most of which I bought at the Dollar Tree. Some Dollar Trees even carry epoxy now. Glue the bottom of the mason jar to the top of the candlestick. Try to get it right in the center to keep it balanced. Seriously, y’all – that’s IT! This project took me just a couple of minutes to do, and it looks so cute on my table. I feel like it’s really inviting because people can just help themselves to candy when they come over. Another neat thing about this project is that, since candlesticks come in various sizes, you can make several of these and do them all different sizes or do two in one size and one in another – just like candlesticks that you have on your mantel! I am thinking of doing a few others in different sizes and putting different candies in each one. And, I love changing out the candies. I change them out for various seasons – candy corn in the fall, peppermints in the winter, etc. What ever happens to be on sale for the season or I have coupons for. It’s a lot of fun! Thinking of making one or your self? If you try out this DIY candy jar, make sure you come back and leave a comment to let us know how it worked for you and what you think!